This page is dedicated to our happy customers and comments from our patrons. We Love our furry Customers! Submit Your Testimonial To Us! Thank you so much for taking such good care of Missy. We had no worries leaving her with you. She was delivered Thursday safely and smelling soooo good! We have been blessed to find you and your pet resort. I also want to compliment your terrific web site. You run a top notch business with a big heart and personal touch. I have taken my Westie to CHPR since he was a puppy (he is now 10) and couldn't ask for better care for him. He runs and plays and actually gets to act like a real dog! The grounds are beautiful and so dog friendly - I can't wait to see the new construction complete. Sometimes I'm tempted to ask if I can stay too! :) It is obvious from the get go that Lisa and her CHPR folks love dogs. I always feel so good about leaving him and never have to worry for one minute when we're gone. The one time we couldn't get him in because it was full, he went to another facility and when we picked him up, he wouldn't even look at us. Normally he's happy and jumping and excited. Obviously, he could tell the difference as well! 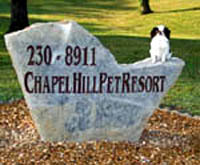 Thanks, Lisa and Clark for providing a resort for our furry friends!